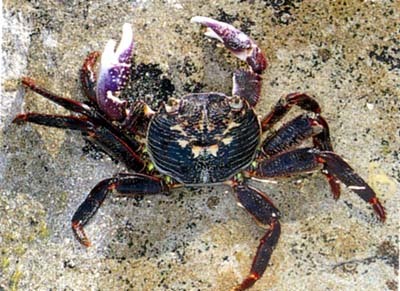 Carapace has broadly rounded edges; strong tooth behind eyes; legs long and flattened; claws purple above and white below. To 80 mm across, but usually smaller. On rocky coasts exposed to strong surf, sheltering in crevices and under rocks from mid to high tide mark. Very fast and difficult to catch. Scavenger and carnivore. Southern and subtropical Australia; Indo-Pacific.